Folks who are at least 18 years of age at the time of enrollment. You must have an active e-mail address and active telephone number. How do I earn and use Points? 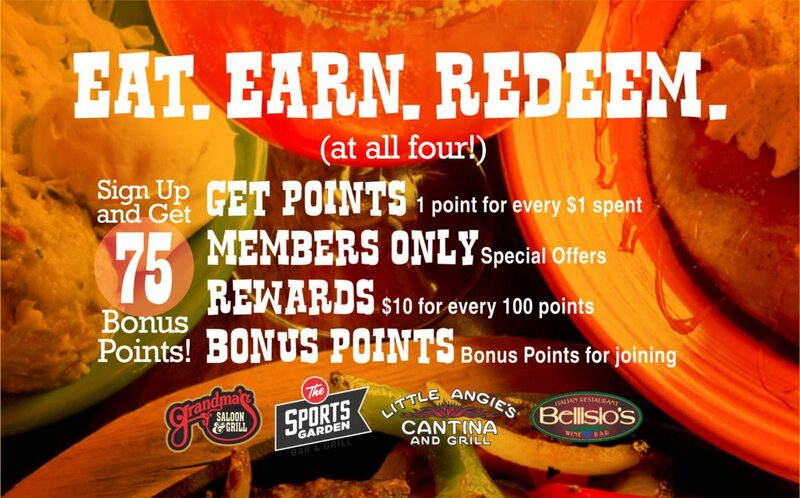 Points may be earned and redeemed at any Grandma’s Saloon & Grill, Bellisio’s Italian Restaurant, Little Angie’s Cantina, and The Sports Garden. Earn 1 point for every $1 spent on all food, beverage and retail purchases. Points can only be earned at time of purchase. 100 points = $10 reward. Rewards issued in $10 increments. Rewards must be redeemed in $10 increments. Rewards points accrued on final purchase amount after any discounts and before taxes. When a reward level is reached, rewards redemptions are available to use on next visit. When you earn 100 points, your $10 reward will be credited within 48 hours of the transaction. Birthday: $10 into holders account. To be used 6 days before, on, and 7 days after your big day. Can’t transfer, share or buy points. Points have no cash value, so no cash back. Points cannot be earned on gift card or online purchases. Can’t get points on purchases prior to enrollment. Points cannot be earned on 3rd party delivery purchases. Grandma’s Restaurant Co. is a family of restaurants and entertainment venues which is committed to making your experience with us enjoyable, fun, and rewarding! Part of that commitment is ensuring your privacy. We don’t sell, share, or give away your personal information to any third parties.